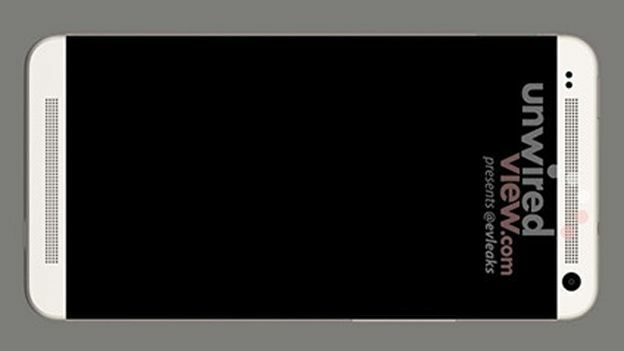 An image of the rumoured HTC M7 appears to have hit the internet today, after Unwiredview got its hands on a press render of the new phone. The site claims to have recieved the image from a "trusted source". HTC's new handset is expected to make its formal entrance at the Mobile World Congress trade show next month, with folk gossiping that the phone will run a 1.7GHz quad-core processor and feature a 4.7-inch Full HD screen. That last part doesn't sound too wide of the mark to us given that Full HD has already appeared in handsets like the Sony Xperia Z and the Huawei Ascend D2. Other specs apparently on offer are 32GB of native storage, 2GB RAM, a 13MP rear-facing camera and LTE support. Unwiredview claims this particular shot was taken from an animation clip made by HTC that instructs new owners on how to load the handset with their SIM card. There's very little to be gleaned from the press shot but we're just going to go ahead and say it; this design looks very iPhone 5-ish to us. The only other nugget of information we can pass on is that it seems HTC might be fitting the M7 with an IR port near the power button on the top of the handset. Stick with T3.com as we'll be heading out to MWC in Barcelona next month to bring you all the latest smartphone and tablet news from the show floor.